Grumman F7F-Tigercat “La Patrona” formerly known as “El Hefe” and ALWAYS “Big Boss Man” to me. It’s the rumble of history overhead. The thrill of neck-and-neck competition. The smell of avgas and desert. As I penned in my Ode to the Reno Air Races five years ago, there are fewer things I love more than a weekend full of fast flying warbirds. This year, for the first time, we kept our visit confined to the pits (instead of the grandstands with the masses). We hung out with some of our racing friends and I enjoyed listening to race strategy and the eternal quest to get even one more ounce of power. 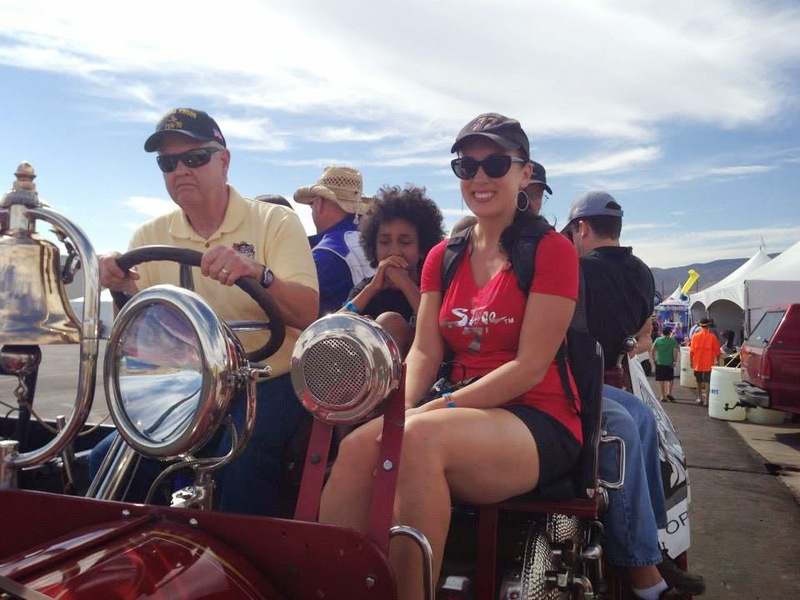 Although both of my favorite birds–Unlimited Gold racers Rare Bear, a Grumman Bearcat, and Strega, a P-51 Mustang–bowed out of competition due to engine problems, I still loved every minute. And here are a ton of photos to prove it! Sport Class guys out on the ramp. Kevin Eldredge won top spot in the Sport Class Medallion race on Saturday. Eldredge is used to going a heck of a lot faster though, as he also races the Relentless NXT. The Medallion race was created for the “slower” sport racers, including many like our friend Scott Pruitt in stock Vans RV aircraft. Melissa Pemberton flying aerobatics while her hubby Rex Pemberton worked the wing suit. Unlimited Silver race. From left: Grumman Tigercat, P-51 Mustang and Corsair. A pair of pretty evenly matched Seafuries. One of a handful of flying Tigercats. Folding up that 51 foot wingspan. Sport Class Silver Race on Saturday. The coolest part? The top two finishers (before a penalty anyway) were women which I don’t think has ever happened before at Reno. Race winners get to ride the vintage firetruck across the show line and wave at the crowd. Saturday’s Unlimited Gold line-up with Race 77 and Race 7 being my favorites. I still hold out hope that Rare Bear will win again. Saturday’s Unlimited Gold insanity between Strega (red/white P-51) flown by Tiger Destefani and Voodoo, flown by Steven Hinton. Tiger nosed ahead by 12/100ths of a second but was disqualified for flying too high. Boo. Even worse, he blew up his engine and couldn’t race on Sunday. T-6 in the morning light. For the first time in years, we got to the Reno Air Races early enough to see the biplanes race. The yellow Pitts Special is flown by our friend Jeff Rose. Practically life sized. Those biplanes are TINY. No offense to jet lovers, but the Jet Class is my less favorite race to watch. My favorite spectator. And his little dog, too. We joined the crew of Race 49 for Bob “Nasty” Mills. He got so close in his Bronze Sport Class race, finishing fourth. For a few minutes, I thought we’d see rain but no luck. Mike Mangold, if I’m not mistaken. The F-22 Raptor flew a demonstration that blew my mind. The F-22 moves in ways that just don’t make sense. Heritage flight with a P-51 Mustang and F-22 Raptor. Pretty incredible the difference a century or so makes in air defense technology. I’d still rather watch the P-51 though. P-51 Mustang and F-22 Raptor. Rare Bear pulled out of Sunday’s race within the first couple laps. 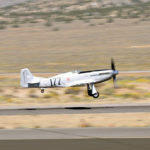 Sunday made a sad story for Precious Metal, a P-51 Mustang with a Griffon Rolls Royce engine and contra-rotating props. After a heroic 11th hour repair, Precious Metal came up from the back of the back to finish third only to find out later a line judge disqualified him for supposedly busting a show deadline. Sunday’s race ended with Steve Hinton winning his sixth title in Voodoo (not pictured). Mr. T and Bill Beaton who raced his modified Harmon Rocket. Yours truly on the firetruck for the third time. (SO COOL!) 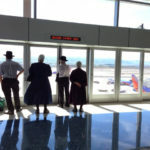 Hopped on with friends of Kevin Eldrege (in the cowboy hat). Fire truck ride down the show line. Early a.m. ride meant the stands were still filling up. 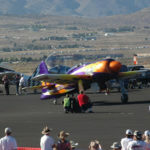 Mr. T’s birthday always falls during the Reno Air Races which makes for a great excuse to celebrate extra!